Leave the M4 at Junction 33 and take the A4232 towards Cardiff. At the first junction follow the signs onto the A48 heading towards Cowbridge & Bridgend. Follow the A48 through the villages of St Nicholas and Bonvilston. Just after leaving Bonvilston, you will see “The Aubrey” on your left. Take the right hand turn off the A48, following the brown Tŷ Cerrig tourist signs. Keep following the lane and after approx. 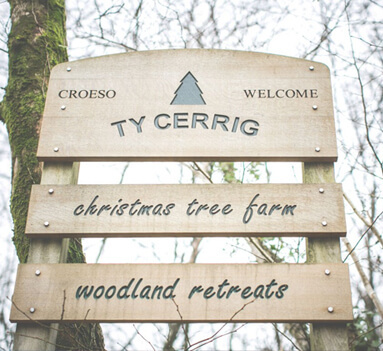 ¾ mile you will see the entrance to Tŷ Cerrig Woodland Retreats on your left. IF YOU HAVE ANY QUESTIONS OR WOULD LIKE TO GET IN TOUCH PLEASE CONTACT US VIA TELEPHONE ON 01446 327337 OR 07896967648 OR USE THE ENQUIRY FORM BELOW.